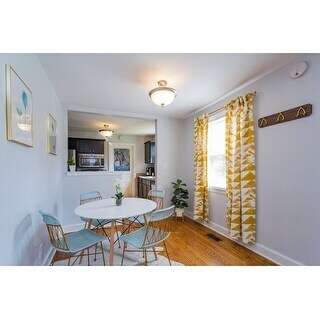 I have been looking for this type of rug for months. Finally found the color but didn’t know if the size was going to be a fit for me. I decided to order and I am glad I did. It has made my living room so glam. I love it. 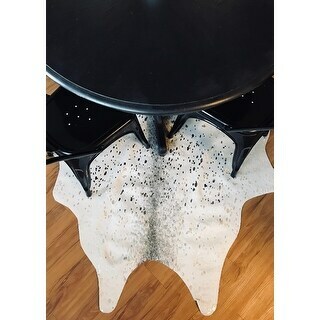 The realistic look of cowhide is artfully designed with striking color detail. Spotted texture and clean neutral hues make for a sophisticated look. This area rug is power-loomed of synthetic acrylic for added durability. Lush silver metallic accents on pale stone grey make this area rug an alluring choice. Small: 3 feet 10 inches wide x 5 feet long x 0.15-inch pile height / weighs 1.4 lbs. Medium: 5 feet wide x 6 feet 6 inches long x 0.15-inch pile height / weighs 2.3 lbs. Large: 6 feet 2 inches wide x 8 feet long x 0.15-inch pile height / weighs 3.5 lbs. I cannot begin to tell you how many compliments I have received on this rug! 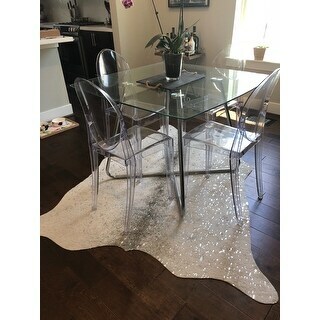 I bought it to place under our dining room table which is white and the colors in the rug stand out beautifully. The rug is thin which is exactly what I was looking for and fits all of our modern decor. LOVE this rug! Thin and decorative and looks very elegant with the metallic accents. This rug is clearly meant to be a decorative accent rug and that is the purpose it serves exceptionally well. I have it next to by bedside by my vanity table and it provides the amount of covering needed so I don't wake up to cold hardwood floors in the morning. Love this rug! The reflective silver with the light gray/cream tones reflects light in our new living room. The rug adds a layered look over another neutral rug and it also looks great on it's own. I appreciate knowing it is faux. I am looking forward to buying a couple more. 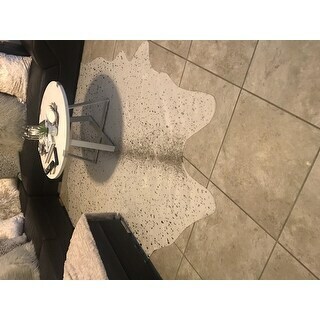 The price feels a bit high for the size comparison but Overstock has THE best prices for this product and the packaging was brand new....love this rug! This color is more of a cream hue so if you are looking for the crisp white/silver rug look into the graphite color...a great product! this is nice but. .
very very thin. absolutely no pile. but decorative. I had to have several sent to me since they all arrived with bent edges. they are wrapped in a plastic rolled and the ends are folded over. it is impossible to remove the fold. fyi. I thought it would flatten out. but it did not. I love this rug! It is so pretty and the silver catches the light which makes it shine. I didn’t give it 5 stars because the quality is a little cheap, but the looks make up for it. I put it with my dining table to add nice contrast! 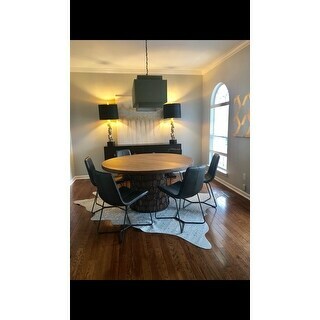 This piece was a perfect fit for the mixture of rustic and mid-century decor/furniture in my living room. The color slightly varied from the online photo, however I like its contrast with the grey and taupe mixture in my flooring. A rug pad was not even required due to the rug backing essentially maintaining placement on my ceramic tile flooring. Great buy! We bought this rug to put under our office desk. The color is awesome, it’s a thinner rug so just make sure that’s what your looking for. We have no complaints! This is the first time I ordered from overstock. 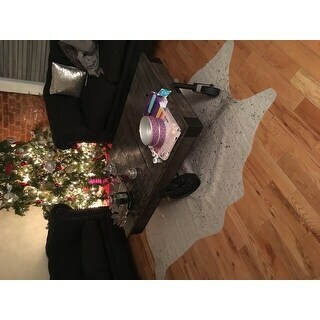 I just received my rug yesterday and I love it, shipping was super fast and the rug looks exactly like the picture. It goes perfect with my living decor. 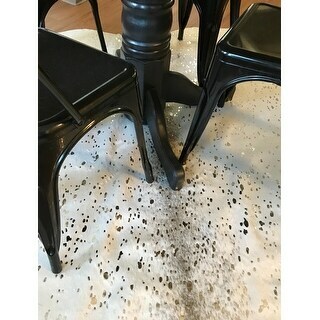 Looking forward to purchasing more item from overstock to finish decorating my home and will definitely recommend your site to my family and friends. Thank you overstock for making it easy for me to find what im looking for to make my home beautiful. Looks pretty but the quality is marginal. This is an amazing rug. The compliments I’ve gotten are endless. 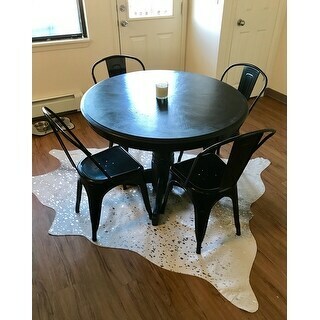 I was afraid it was going to be cheap looking, however it’s jot cowhide at all but it has a very nice texture. I wish I would’ve gotten the bigger one though. So unique and looks just like the pictures! The only reason I docked it one star is that it’s very obviously felted material when you actually touch it. But other than that, totally worth the price! Perfect beneath my small dining set. It lays well on hard wood floors without any kind of pad beneath, and the silver specks really pick up in the sunlight. Love it - look of hide without the guilt! The design of the rug is very pretty with just the right amount of sparkle. It is a little smaller than I envisioned given the dimensions, so I had to change my space around some to accommodate it. It is very thin and light in color so I worry about how it will hold upon laundering it. The rug was just laying in a corner by the front porch, on the dirty concrete with the plastic ripped off. I love the rug. I just wish that I would have bought it a few shades darker. I am afraid of spills now. Other then that the quality is perfect and it looks amazing. This area rug is pretty cool. I like the animal shape and love the silver sparkle. I placed it in my bedroom and have my mirrored dressing table and vanity bench on part of it. It makes for a cozy and comfortable space. In love with this rug!!!!! True to pics!!! Just enough metallic without being overboard. Very soft to touch and soft on the toes!!! . Is thin, but i have on carpet so its perfect!!! 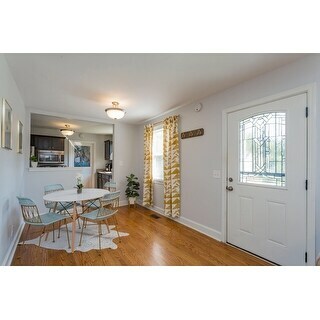 "What is the exact width"
"is this rug more of a white color with slight metallic accents? 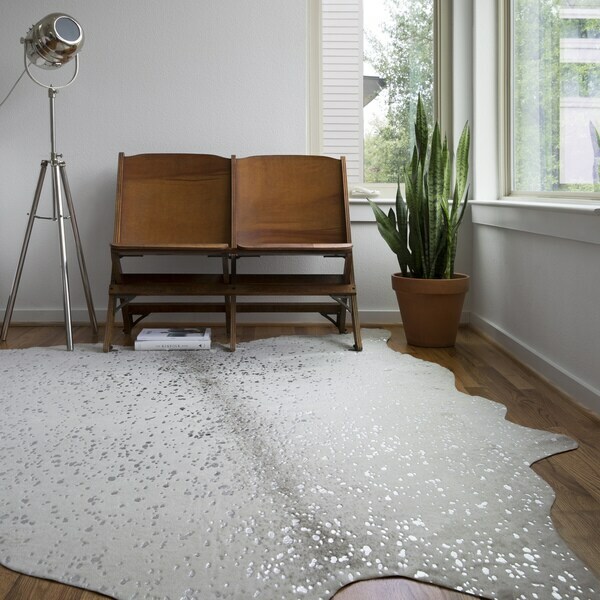 or the majority of the rug all silver/metallic?" "How has this rug held up since you've owned it? Is it easy to clean or spot clean?" have one in red gold love them price is great! "What is the best way to clean this rug?" Vacuum regularly, shake it out, and rotate. There are numerous links on the net with information.